The Inbox shows all the projects uploaded and processed by AutoEntry. They are filtered by with the most recently updated project to the top of the list. All extractions are grouped by account number under each project with each account having their own extraction. If you can't find your specific statements, it's possible that they were uploaded to a current project and are simply at the end of the extraction in that project (projects are sub-divided by account number). If not, they might have been rejected and are in the rejected folder. Project - The name of the project with an option to edit the name of the project and to delete the project. Deleting the project will delete all statements and accounts uploaded to that project*. Updated - The date that the project last had statements uploaded to it. 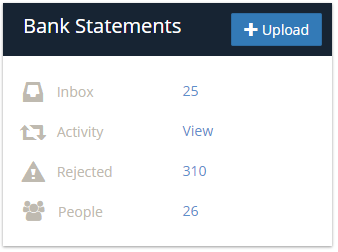 The blue View icon allows you to view the details of the extraction for that account. Account - the account number for the statements uploaded. Download Button - to download the extracted statement data. Files - the number of individual files uploaded to the project. Click on the Download link to download the original scans again. Trash Can Icon - Deletes that particular bank accounts extraction*. *Caution - The delete function is irreversible! The files or extracted data cannot be retrieved by us if a user deletes the data from AutoEntry.